This summer I read through the entire Bible in 83 days! I had joined the 90 Day Challenge hosted by Mom's Toolbox. This was quite a commitment, but well worth every minute. You should seriously and prayerfully consider joining this incredible challenge starting again January 3, 2011. Reading the Bible cover to cover gave me an incredible perspective on salvation history and flow of God's action through Israel. I could see so clearly the chaos and rebellion of Israel, and God's incredible patience and His unspeakable holiness. This view of the old testament strongly affected how I read about the revelation of Jesus as the fulfillment, the discipline of the church and the final wrath of God in Revelation. The rapid pace of this reading schedule kept the recently-finished books of the Bible so fresh in my mind that I began to see patterns and repetition I had never noticed before, adding to my understanding of scripture and of God -- beautiful patterns of forgiveness and redemption, and horrifying patterns of man's sin and rebellion. Reading through the entirety of scripture (whether in 90 days or over the course of a year) gives a better perspective for understanding the context of smaller portions you may read or study. I have noticed this especially in my recent study of 1 Peter. As I read this book more carefully for a Bible study group, I recognized references to the law that helped me understand the author, his purpose in writing the letter, and its recipients; deepening my understanding and appreciation for this book. Reading in only 90 days requires a serious commitment and significant sacrifice. In addition to the benefits listed above, the discipline, sacrifice and faithfulness required to complete this goal taught me a lot about myself. I quickly saw the many things I spend my time on that I really don't need to do. It put a spotlight on areas where my priorities are not what I want them to be, or what they should be. But this also taught me that God desires sacrifice and faithfulness in our lives as we seek to know him better. I understand that this challenge is not everyone. But I encourage you to playfully consider committing to this, or some another program that will challenge you spend daily time reading Scripture. This "Bible in 90 Days" / "Blogging through the Bible in 90 days" challenge also has a great online community for support and accountability. But I recommend you find a friend who will read with you and help keep you faithful. This short, three months commitment will take a lot of your spare time and then some, but it can be a life-changing experience. I am still seeing the ways God used this challenge to change my heart and mind -- to reveal things in me he wants to change, but in the big picture, to know and love HIM more. 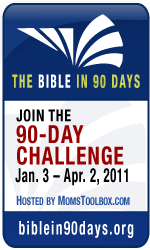 On Monday, November 29, Mom's Toolbox will be posting a link to the official sign up for the next session of Bible in 90 Days/Blogging Through the Bible in 90 Days. Wow! That is quite a feat! I have done the one year reading plan more than once and found that quite a stretch. I will think and pray about it, as your points are good, but realistically, I do not see myself managing it. Good for you, may the Lord bless your diligence. This is great! I'm starting today! !